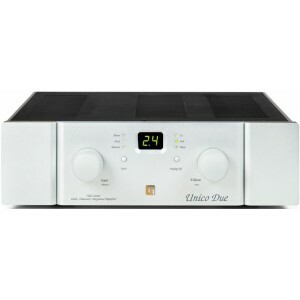 Unico Due is a high-performance integrated amplifier featuring built-in phono stage and multiple inputs and outputs. Matching CD player also available. Unison Research Unico Due is a high-performance integrated amplifier that combines a valve pre-amplifier with a solid-state output stage for a class-leading performance that draws heavy inspiration from the flagship Unico 90 and Unico 150 models. The electronic circuitry of the Unico Due has been completely redesigned from the ground-up. By working to the same brief as previous Unico models, Unison Research have introduced changes in the circuitry, the power supply method, the pre-amp stage, the power amp stage and with the variety of settings and inputs. All based on generously sized 105µm tracks and using only the finest possible components, the circuit board is fed by a sophisticated power supply method that features a specially designed encapsulated transformer for increased efficiency and superlative sound. The heart of the preamplifier stage is based around two ECC83 double triodes (one per channel), which were purpose-chosen after hours of listening tests. Configured as a gain stage followed by a cathode-follower, the circuit’s low output impedance efficiently drives the power stage that follows for minimal electrical interference. Additionally, the Unico Due has settings for AV passthrough, subwoofer output, DAC output, a TAPE loop and to adjust channel balance. The Unico Due is a powerful, easy to accommodate amplifier with a wide range of features and a sonic presentation that boasts all the benefits of valve technology with none of the shortcomings.